I very very rarely drive in town due to all the traffic calming and am averaging 24-25 mpg. Since fitting a filter and the pipe delete it has gone down slightly in mpg due to enjoying the noise more. I hate dropping below 2000 rpm when driving as it feels wrong so happy with it. possibly the saddest thread ever!!!! I like to see what I can get out of it (something to do whilst stuck on a smart motorway), and the best I've ever got was from a 3.6 PDK Coupe. I'm pretty good with my right foot and managed to get 25.8 out of my 6.0 V12 Aston. Best ive had out of mine is on a long trip to Manchester & back. Cruising all the way there & back, covered something like 350 miles and averaged 30mpg. Did the same driving to Newcastle & back which was about 400 miles. I use mine as a daily, and its 70 miles of twisty B-roads as well as about 5 miles of sitting in slow moving traffic. I average between 26 and 27mpg per tank of super unleaded. I do notice I get slightly better mpg and tank range if I use V-Power, but not sure if that offsets the more expensive cost of it. 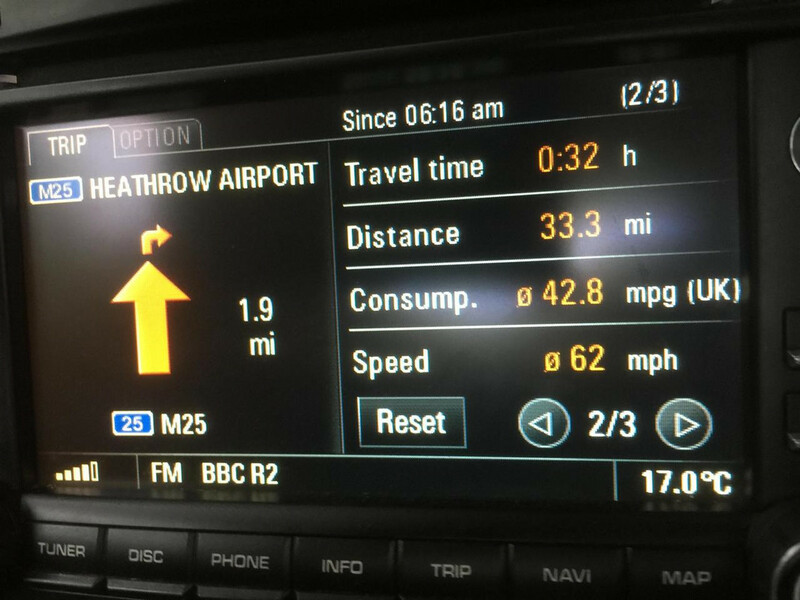 Best I had from my 911 Turbo was 32MPG on a motorway. Since I fitted all the RS kit the best it now gets is 27MPG, proof the spoilers do their job. I can get 35mpg from my 4.4l v8 diesel Range Rover on a run. I do about 12k miles a year in that. My other cars probably do 7k between them and I never try to be efficient. SL55 is horrific in slow traffic, around 12mpg. DB9 is never good but then it never sits cruising. CSL is always driven like itcwill ecplode unless on full throttle and over 5k rpm, as for the 996 turbo, every round of upgrades seems to involve more/bigger fuel pumps and larger fuel line and injectors. I can only assume that reduces losses and makes them more efficient. I will never do enough miles in it to care. I'm sure once I saw 28mpg but usually 21mpg, hey it's better than the XKR we had, I once returned 2.3mpg would pass everything except a fuel station! would pass everything except a fuel station!